The eighth and final Impressionist exhibition was held in 1886, by which time the twelve-year-old movement was no longer regarded as radical. As the oldest of the artists who exhibited with the Impressionists, Camille Pissarro may have felt a particular need to stay abreast of current developments and keep his work fresh. The bold optical experiments of the young Georges Seurat, who used small dabs of juxtaposed color to build pictures of great effect and intensity, intrigued Pissarro, who embraced Neo-Impressionism and specifically the pointillist style for four years in the late 1880s. Pissarro created the present painting from an earlier composition in his studio rather than in front of the motif, which was his usual practice. 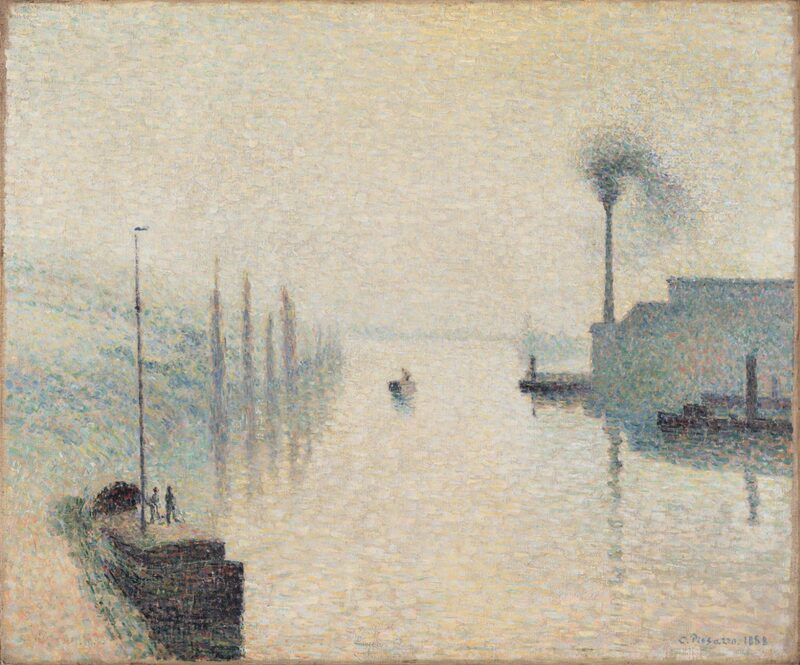 He had visited Rouen in 1883 and made several drawings and etchings of the Seine that he consulted five years later when painting this foggy view of factories and barges on the river. An industrial landscape dominated by a smoke-belching chimney, the scene is rendered with great beauty in a subtle range of colors. The broad, flat frame with its laurel-leaf border was designed by Pissarro for this picture, though it may originally have been painted white. Jennifer A. Thompson, from Masterpieces from the Philadelphia Museum of Art: Impressionism and Modern Art (2007), p. 62. During the late 1880s, Camille Pissarro was drawn to the brilliant young artist Georges Seurat's pointillist painting technique, which consisted of composing images by using countless tiny dots of color. Not only did Pissarro champion Seurat's works to skeptical friends but also, for a few years, himself adopted the pointillist style. With its subtle palette of pink, white, and rose, this simple, atmospheric view of a docked boat seen through the fog achieves a stillness and serenity comparable to the almost hypnotic slowness of Seurat's own seacoast landscapes. Pissarro's composition precisely follows an etching of 1883 and was probably done entirely in his studio rather than before the actual scene. Painting in this manner was excruciatingly slow, however, and Pissarro, an especially prolific artist, executed relatively few works in the pointillist style. Indeed, he would soon move on to a revised Impressionist style and abandon pointillism, not only because it hampered his naturally spontaneous temperament, but also perhaps because he found it difficult to produce a sufficient body of work to support a large and demanding family. Christopher Riopelle, from Philadelphia Museum of Art: Handbook of the Collections (1995), p. 203.